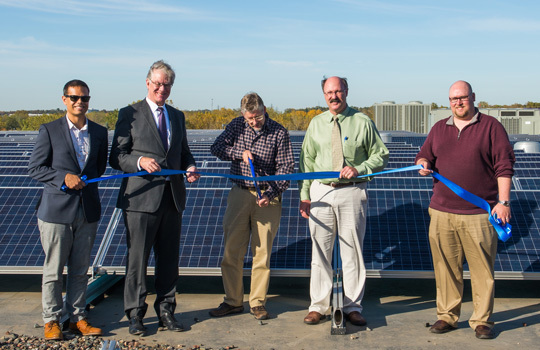 We had a beautiful day to cut the ribbon and commission 1 MW of commercial rooftop solar in St. Paul. With St. Paul Mayor Chris Coleman on hand, IPS Solar, Xcel Energy, and building owners alike joined in the celebration of the largest solar project in St. Paul to date. After touring the 4 buildings in the Green Line Portfolio, we held a reception in the beautiful space that is University Enterprise Labs. After some brief remarks from the parties involved, we capped it off by enjoying some drinks and apps with our guests and media. Thanks to everyone who attended and please join us for our next solar celebration. This entry was posted in Commercial, Events, IPS Projects, IPS Solar on October 18, 2017 by Kyle Wehnes.